One Radiator’s key strengths is flexibility in different environments and authentication use cases. Recently, a customer had a new case for authenticating network device administrators with Microsoft Azure Multi-Factor Authentication (MFA). The devices use TACACS+ and a solution was required to integrate with Azure MFA Radius. Thanks to the flexibility of Radiator, this can be done without any extra hassle. When a user logs in, the device sends the username, static password and one-time passcode with TACACS+ authentication request to Radiator. 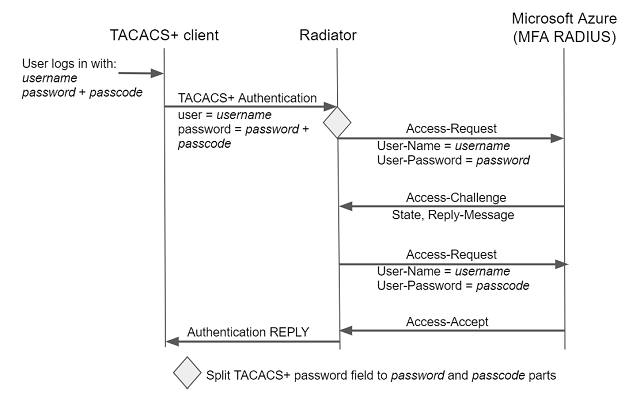 Radiator processes the TACACS+ request and starts MFA authentication by first sending the password as RADIUS Access-Request. Azure MFA responds by replying with Access-Challenge prompting for the passcode. In turn, Radiator responds with password reminder (passcode of 6 numbers) to complete the authentication. After this, authentication REPLY is delivered to the TACACS+ client and access is granted.